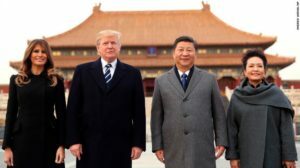 Analysts for a special intelligence unit of the Chinese government worked around the clock to compile information on U.S. President Donald Trump that can be used by Chinese President Xi Jinping during Trump’s first visit to China. The unit, code-named Skyheart, consists of some 350 officials who work at a secret facility in western Beijing called Western Hills, site of the People’s Liberation Army (PLA) general staff headquarters where China’s underground nuclear command and control complex is based, Bill Gertz reported for the Washington Free Beacon on Nov. 8, citing a person familiar with the operation. Skyheart operatives gathered information on everything from the kind of food the American president likes to the brand names of products he prefers and the television shows he watches, the report said. “No detail is too small to be gathered,” said the person familiar with Skyheart. Ken deGraffenreid, former deputy national counterintelligence executive, told Free Beacon that the Chinese use such programs to manipulate high level U.S. officials during visits and negotiations. By contrast, the CIA’s operations directorate produces inferior leadership profiles in their level of detail, he said. Most of the best U.S. intelligence on Chinese leaders comes from National Security Agency electronic intercepts, Gertz wrote. “They use implication. The technique is that ‘We know more about you than you realize.’ It can be used as an intimidation tactic,” deGraffenreid said. He said the Chinese will likely press Trump to return dissident billionaire Guo Wengui, who gone public in the U.S. via social media on high-level Chinese leadership corruption which may have forced the exit of Xi Jinping “corruption czar” Wang Qishan from the Chinese Communist Party’s Standing Committee of the Politburo, Geostrategy-Direct.com reported. The analysts have also been closely scrutinizing Trump’s Twitter feed. Twitter is blocked across the Chinese mainland along with other social media outlets including Facebook, YouTube and Instagram. Chinese security services “will be engaged in massive electronic surveillance during the visit by the president and First Lady Melania Trump, along with the group of White House and administration officials and corporate business leaders,” Gertz wrote in his report.